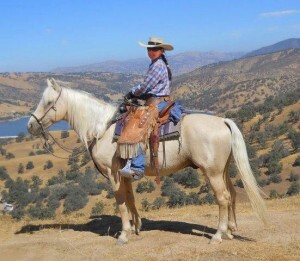 JaF Morgan Stock Horses is the fulfillment of a dream for me. When I look out at all the horses, watching them race around and play together, or when I am schooling one of these willing and talented young Morgans, I know the meaning of being truly blessed. 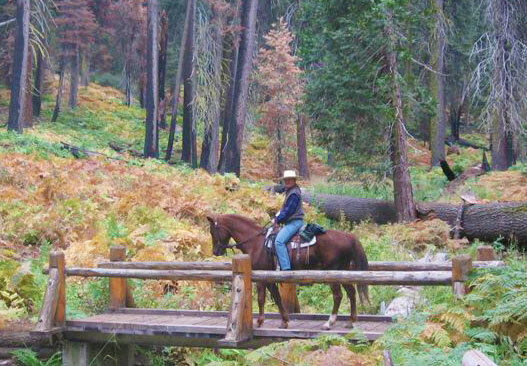 As I am completely enamored with the beauty and athleticism of the California bridle horse, my ranch is named “Jaquima a Freno” (JaF) which means “Hackamore to Bridle” in Spanish. 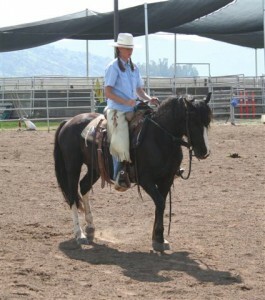 While most of the Morgans sold here are ridden primarily in the snaffle since that is generally where they are in their training, I hope to do this ranch name justice by breeding for the natural athletic ability and mindset necessary for these wonderful Morgans to go on and become true bridle horses. I know without a doubt if they are good enough to go there, they are good enough to do anything. In the early California tradition, the term “bridle horse” refers to a spade bit horse, a horse straight-up-in-the bridle. We know that many vaqueros preferred Morgans for their bridle horses, and used Morgans on the huge ranches that sprawled across early California and Nevada. Certainly, the baroque style of the Morgan lends itself well to carrying a bit such as the spade. Training a true bridle horse takes a commitment of 5 years or more. For me it begins in the snaffle bit and works through the various stages of hackamore training as the bosals and mecates become smaller and lighter. The goal is to reach the point where just a whisper of the mecate reins is needed as the horse becomes more and more adept at working off messages transmitted via the rider’s body. Next it transitions to the “two rein” stage which introduces the horse to the spade bit, and later progresses to riding straight-up-in-the-bridle. To become a bridle horse requires choosing an athletic and willing mount, and I have found the Morgan to be this, and more. I believe strongly in the concept of “horses being allowed to be horses”. Our Morgans live in open pastures where they can romp and play to their heart’s content. One pasture has deep, and in some places very rocky barrancas, lots of trees, water flowing in the rainy season and a bridge crossing. Here the young colts and fillies learn many of the skills they will need later as they go on to become solid trail horses. Since I have several different pastures and large paddocks available, I love to change “sleeping arrangements” around for the horses. I have found that by frequently rotating horses into different groups throughout their first few years, these horses learn some important life skills and social skills that are valuable later on. The yearlings, for instance, might live together with the four-year-olds who are being started under saddle. The stallions might babysit the new weanlings. 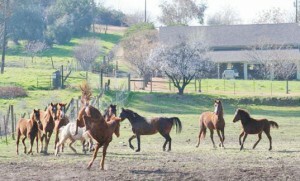 The broodmares might be housed with the two-and three-year olds. Then just about the time my working students and I get used to where everyone is – I’ll change it all around again. By the time they are old enough to start under saddle they know how to get along with, and fit in with any group of horses. One very important factor at JaF Morgans is breeding sound minded, solidly built and beautiful Morgans. My stallions, past and present, plus all of the broodmares are descended from solid “Western Working Morgan” bloodlines. Now that there are several foal crops on the ground, there is no question of the quality these bloodlines produce. They have the conformation, mentality, and physical aptitude to do virtually any work – and look good doing it. But just breeding quality Morgans isn’t enough. I begin training the foals from the day they are born. As I also have working students on the ranch, the foals and yearlings become well adjusted to people and proper handling. By the time they are old enough to ride, they are incredibly easy to start under saddle. They have never learned to say “no”. They are willing and eager to go to work every day. Based on my experience spending many years starting colts of various breeds for the public, I can testify to the fact that this attitude is not commonly seen – and I love it! Selling foals is not a primary goal for me. Rather it is to raise the foals to riding age, spend several months of serious, work-oriented saddle time, and then pursue finding homes where they will be safe, happy and have consistent work, allowing them to develop to their full potential. By the time colts are ready to leave JaF Morgans, I know they have a strong enough foundation that they can be successful at just about any discipline their owner is interested in. They have been exposed to many, many different aspects of training – some of which the average horse owner might not think of. And they have a very strong work ethic. I am very proud of the work done here. 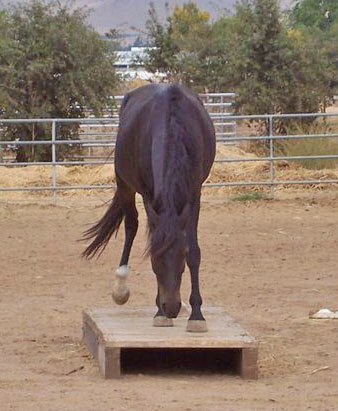 When these colts are trained, they are “trained”. Based on the JaF track record and feedback, I feel we can continue to produce Morgans of excellent mind, conformation and beauty with a solid foundation and honest work ethic that will carry them through the rest of their lives.